Pamela is the founder of the website Ricamente.net. 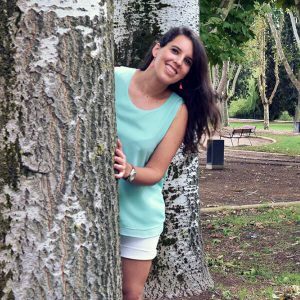 The site is predominantly a blog where Pamela writes about personal development and the relationship between mind and life in her native language of Portuguese. She says her purpose is to help people think better of themselves to be able to live the life they want. By writing and sharing in a lighthearted way, Pamela’s audience can gain an understanding of how the mind works and its ability to control them even when they are not aware of it. Pamela goes one step further by listening to her client’s problems and helps them directly through coaching procedures. See it in action over at: Ricamente.net. PR: My website is everything: it’s like my presentation card and it helps me to present myself and my services to people in an easy and beautiful way. It has brought me contacts, friends, new clients and relations with other bloggers and it has been a very enriching experience having it. PR: I would say zero in web design but I do love graphic design. L&S: How easy was it to set up your website exactly the way you wanted it with our theme? PR: Honestly I had help because I am a newbie with wordpress and it was the first time I was installing a theme so I didn’t want to screw up. But once I have the demo installed it was very easy for me alone to design it the way I wanted. L&S: Why did you choose our theme? What features have you found most valuable? I just loved the design! Simple, clean and beautiful. And I absolutely appreciate all the features included like the pop-ups, the landing pages, the beautiful opt-ins, testimonials etc. I am not using the pop-ups yet, but I know that if I want them it’s very easy to put them there. The same thing if I want to create more landing pages. Since launching her website, Pamela has been able to help more people by reaching a wider audience. People in her circle of family and friends have reacted to her blog posts positively and come to her seeking more advice and guidance. Using the blog as a platform to showcase her skills and experience has also helped people with similar mindset blockages who she has helped via her coaching packages. We know that the entrepreneurial journey can be a tough one, which is why we wanted to ask Pamela what her parting piece of guidance would be for aspiring girl bosses. The same advice I gave myself: life is too short to not follow your dreams. Years from now you will regret never starting, so go for it!! But yes, move forwards intelligently, control the risk and start simply. This is just the tip of the iceberg! For more information head over here to discover our themes. If you’re not sure what you need or you can’t wait to get a website just like Pamela’s then get in touch and let’s chat. See more from Pamela by checking out her Facebook page, Pinterest, Instagram or take a look at her swoon-worthy site at Ricamente.net.